Another Eurobowl in the bag – Scotland cap number 5, 10 years after cap number 1! A great weekend, with only the Blood Bowl performances being disappointing. The Wales team did a brilliant job at the SWALEC stadium, home of Glamorgan cricket club, which was a fantastic venue with a free-flowing bar, superb AV equipment and a lovely atmosphere throughout with plenty of space to socialise. 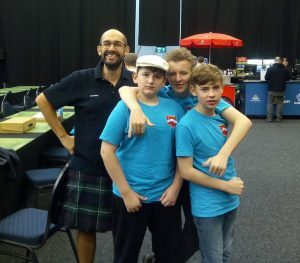 I’d taken the kids along in the first ever all-U16 Europen team, and they had a superbly enjoyable weekend as well. I had other chances – a two dice block to free a wight to blitz the ball carrier failed, as did a GFI to surf late in the half, but I went in 1-0 down. Facing a full team of 11 I would have been happy with a draw, but Nuffle messed with me when my flesh golem caught the ball. Made the rookie error of thinking 8 turns would be enough to wander up the pitch, and at this point the lizards started leaving the pitch, but in turn 7 the golem got bogged down within range of the endzone and it all went wrong. Kudos to Dan for starting his captaincy with a win for himself and the team, as we went down 4.5 to 3.5. In the new scoring system, 0 points. This will be a recurring theme. Game 2 was against Austria, Lewdgrip’s Chaos Pact. Managed a fair amount of pressure on his drive, but his Dark Elf squirmed free and squeaked over the line in turn 6, giving me 3 turns to score back. Sadly, it was a deep kick, and I messed up my strategy, pushing too hard for the equaliser at the half. This did not go well, and a failed ghoul dodge meant I went in 2-0 down. On my drive I scored in 2, and then popped the ball loose, but he recovered it again. And then nonsense, as I managed a long pass after some serious shenanigans to pull it back to 2-2. Sadly, another 4.5 – 3.5 loss, and still 0 points. Game 3 v Hungary, this time against Nelkor’s unconventional Wood Elves – 2 wardancers and 10 linemen! I managed my first casualty of the day in this game, but as he also ran out of space in the KO box I shouldn’t moan too much. A 2-0 win, and a first round win for Scotland. I had a quiet evening with the kids, though I understand the Cardiff night life played host to a good number of Blood Bowlers, making the most of the clocks going back and the fairly late Sunday finish. Game 4 was Norway, Straume’s Dark Elves, who I had faced at the NAF Championship. I left an early half chance involving a 4+ dodge into the cage, which worked, but I should have been able to recover, only to be mashed by a 1 in 81 failure. Shouldn’t have made the mistake, and deserved to lose 1-0 against a great player. Sadly, another 4.5 – 3.5 loss. Game 5 v newcomers Greece, to whom I had leant an Orc team, but luckily I wasn’t facing them as that would have been confusing. A more conventional Wood Elf team than previously in the hands of Cana, and ended up on stream again. Game started well, killing the strip wardancer in the first couple of turns, and I thought I’d done enough to stop the score, only for the elfs to do the elfy thing in turn 8. Plenty of carnage on my drive, but again mostly KOs, so when the captain’s orders came through to push for the win I was sceptical, and pleased when they were reversed a minute later. I walked it in on my turn 8, and was happy to rely on my golems to stop the one-turner. Made another mistake though, as I had forgotten about his frenzy wardancer, and I’d set a player up two squares back from the line instead of 3. He took full advantage, pushed him into his own half, and then used him to get the two squares that his catcher needed. 3 unprotected GFIs later and I’d lost. Not a trick I’d seen before, but was kicking myself about it. Worth a watch! We won the round, but hosting rights were beyond us at this stage, being fought over between Finland and Malta. Final game and I was on bottom table for I think the first time in my Eurobowl history, facing Quetzal of Belgium’s undead. Managed a 1-0 win, to put the seal on his rubbish results weekend, which culminated in him rolling two lots of triple both downs. Scotland won the round, putting us on 3-0-3 for the weekend, and midtable again. 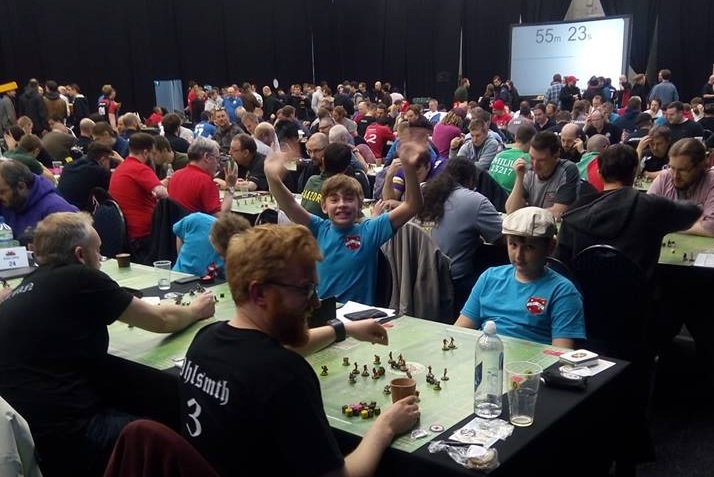 Results wise, congratulations to England after one of their tightest Eurobowl wins, and a huge well done to the Scottish Europen team who managed third. The Sann Clan got a round win against Beer and Blood Bowl, plus a handful of decent individual results, including contributing 10 casualties to Wobert’s most casualties trophy! I’d decided before this tournament to hang up my Eurobowl boots as there is enough strength in depth resident in Scotland and taking part in Scottish tournaments to be able to pick two Eurobowl teams, so it’s healthier for Scottish Blood Bowl to have plenty of opportunities to qualify without taking up a wild card pick. If ever the team end up with only 7 willing to travel, then I’ll expect a call, but that doesn’t seem like a likely situation any time soon, so I’ll be supporting from the sidelines in future, and probably heading up a Sann Clan team in the Europen, depending on the cost of heading to Poland in 2020 and Malta in 2021! I was really pleased for the organisers, Hawca and Dapiranha, plus others, pulling off a triumphant weekend. Very glad personally that the scoring software I wrote survived the weekend, and that I was able to contribute in a small way to the success of the tournament. Next up is to get registered for the World Cup, in which I’ll be playing and probably not having to do anything to do with the organisation, which was an enjoyable experience in Portugal and I looking forward to experiencing it again! Mostly gaming, mostly Blood Bowl!